This week has been another fantastic and inspiring one! We started with some interesting weather on Monday and the skies really opened up to give us some morning tropical rain. The children didn't expect the downpour at all, and we all had to put our hoods up to keep ourselves dry. There was a lot of laughter and dancing in the puddles and to our delight, the afternoon brought thunder and lightning, which lit up the sky! Due to the stormy weather, we huddled into the yurt for shelter and with all the excitement from the storm, the children felt it was a great opportunity to express their feelings. Some of them expressed excitement, and described the lightening in dance form! Some of our Little Forest Folk-ers bravely admitted that the storm made them uncomfortable, and this gave the educators a chance to support them. A story arose about a little cloud, he was so hungry and ate up all of the rain, he kept eating and eating and eating until… POP. The cloud was so full he had to let out a very happy burp! All the children roared with laughter at the idea, and the children who were a little nervous soon began to look out the door and observe the greedy cloud! On our days on Wimbledon common the weather was much better! We had the chance to go on lots of adventures in search of a forest Goblin. The children ended up chasing it for miles around the common, ‘I’ve just seen him there, under those leaves, I saw them rustle!’. As we continued to search, wishing to meet this Goblin, the children decided that leaving a present for him could make him feel more at ease and perhaps make the chances of an encounter more realistic. Very considerate! We used leaves and managed to find a baby Goblin to be a friend for the original one. We really do have wonderfully, empathetic children at Wandsworth! We also had the chance to visit a nature museum which was hosted in the forest by the one and only ‘Club Mud.’ We were chauffeured around the museum, and shown different pieces of artwork created by the home ed group. There were rules we had to stick to such as, ‘no touching the sculptures’ and we had to have a ticket to enter, which was a delicate leaf from the autumn ground. 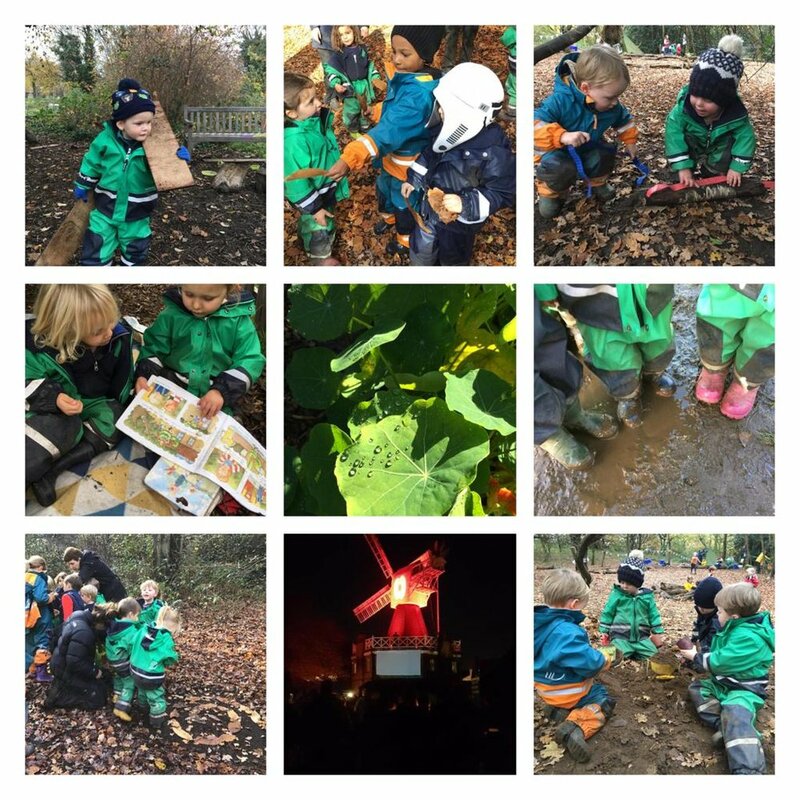 There has been an unbelievable amount of creative role play which we will be continuing into next week, as per our Little Forest Folk-ers request. We have touched on cowboys and cowgirls, watched how to lasso and even build our own. Another well-developed theme throughout the week was doctors and hospitals, a classic favourite. Using goblin medicine to make the "poorly" children and educators feel much better. With all this fun, it’s hard to say goodbye for the weekend! Have a magical one, and watch out for those Goblins if you go for a walk. Newer PostFulham - Obstacle course fun! Older PostWimbledon - Muddy Puddles!